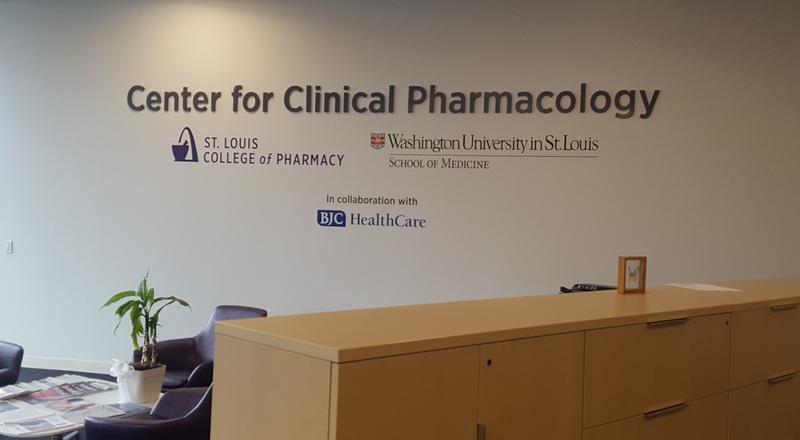 Read the latest news and updates from the Center for Clinical Pharmacology. As a budding neuroscientist, she aims to develop her skills to continue to push science to new heights both in and out of the lab. She is interested in dissecting how stress circuits and endogenous opioid systems interact in the brain to modulate the perception of pain. Specifically, as one of the brain’s primary norepinephrine sources she hopes to study the potential involvement of the locus coeruleus as a mediator in this intersection. With this in mind, it is her long term goal in science to contribute information to aid in the development of new pain medications with reduced addiction liability to combat the current opioid epidemic. Outside of lab, her long term goals are to make a positive impact on increasing diversity in STEM while also implementing better science communication strategies to increase medical/scientific awareness in the public, importantly in places where science education is lacking. She chose Dr. McCall’s lab because he actively supports both parts of her goals as a graduate student, those of course being scientific development as well as scientific outreach. 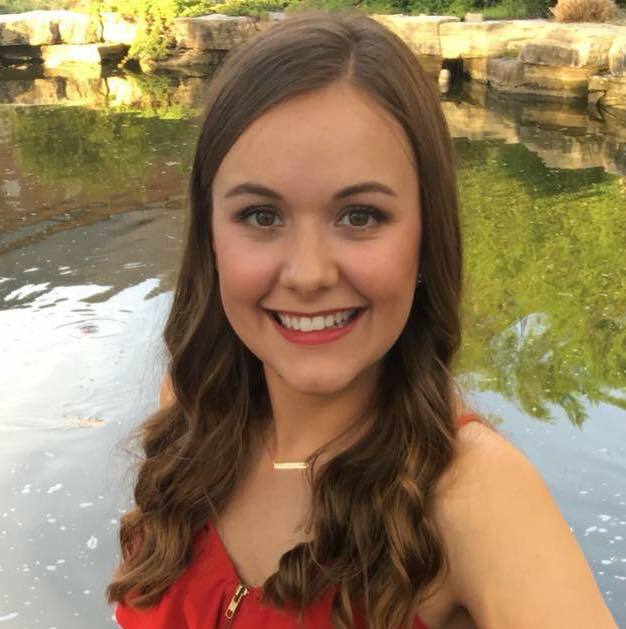 In March, McKenna joined the lab of Dr. Thomas Burris who studies the pharmacology and chemical biology of nuclear receptors. Currently, she is diving into two distinct projects to decide what would be best fitting for her thesis project. She aspires to work on drug discovery and understanding the pharmacology of ligand interactions with nuclear receptors for therapeutics. Choosing Dr. Burris’ lab was a natural fit for her because of her long term goals of working in the pharmaceutical industry. The spunky lab environment and diversity of projects in the lab was another determining factor in her decision. 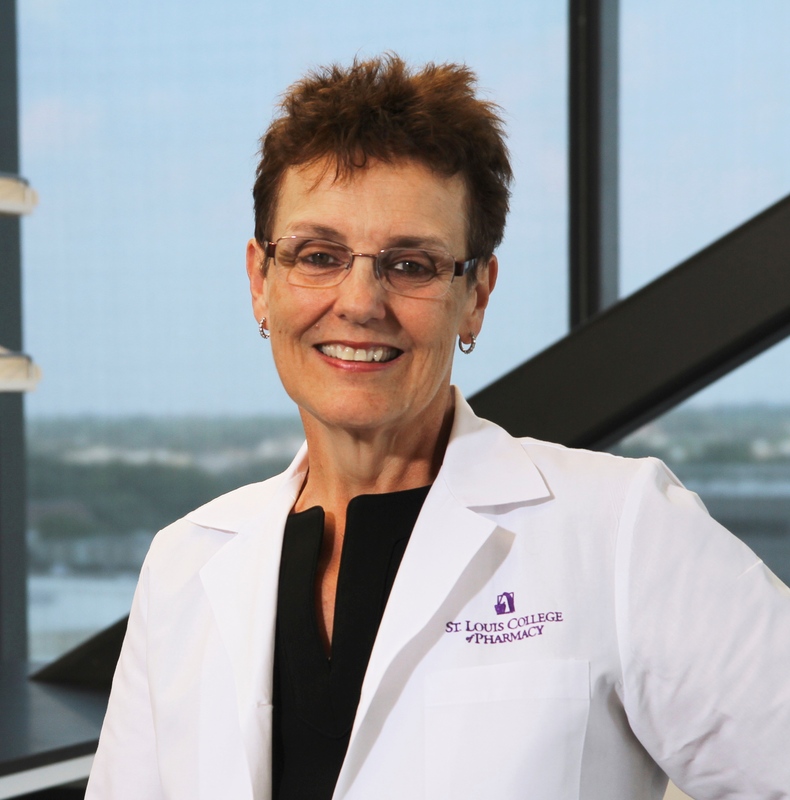 She looks forward to working with everyone in the Center for Clinical Pharmacology and is enthusiastic about the innovative research that is being done here. 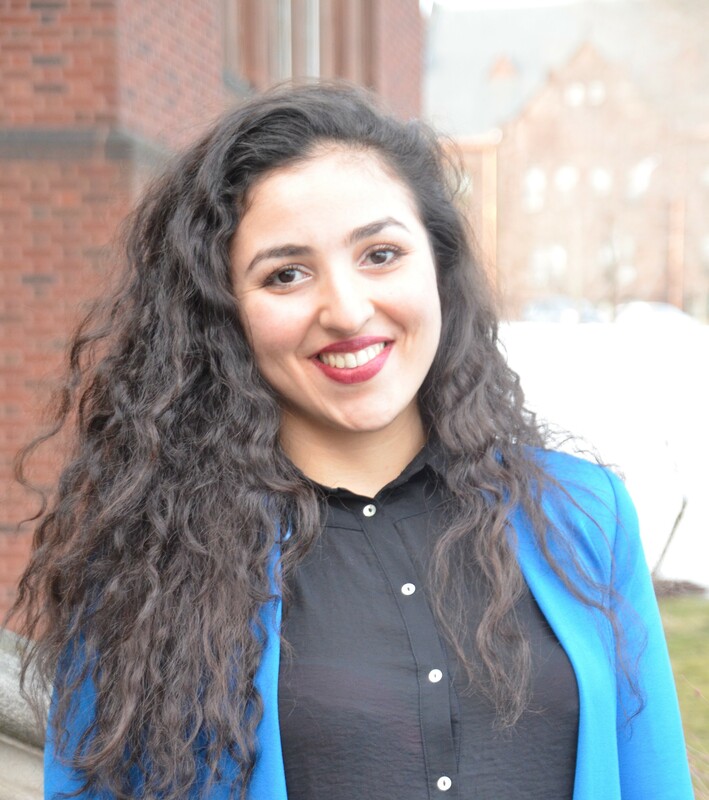 Marwa has also just recently joined the lab of Dr. Ream Al-Hasani. She is interested in unraveling the relationship between opioid withdrawal and the inflammatory response. She also seeks to understand the role of the immune system during withdrawal. Opioid research is very timely due to the current crisis, and understanding the endogenous circuitry is essential for the synthesis of safer opioids. She was drawn to the Al-Hasani lab due to the topics, cutting-edge techniques, close partnership with the McCall lab, and Dr. Al-Hasani's leadership. The Center will launch its monthly seminar series on Thursday, October 4, 2018. The seminars will be held on the first Thursday of every month at the Academic & Research building on the St. Louis College of Pharmacy's campus. Click here to download a copy of the seminar schedule. In addition to this seminar series, the Center will also begin holding monthly journal clubs. The first is scheduled for Friday, September 21st. For more information, please contact Ms. Jodi Maslin at jmaslin@wustl.edu. 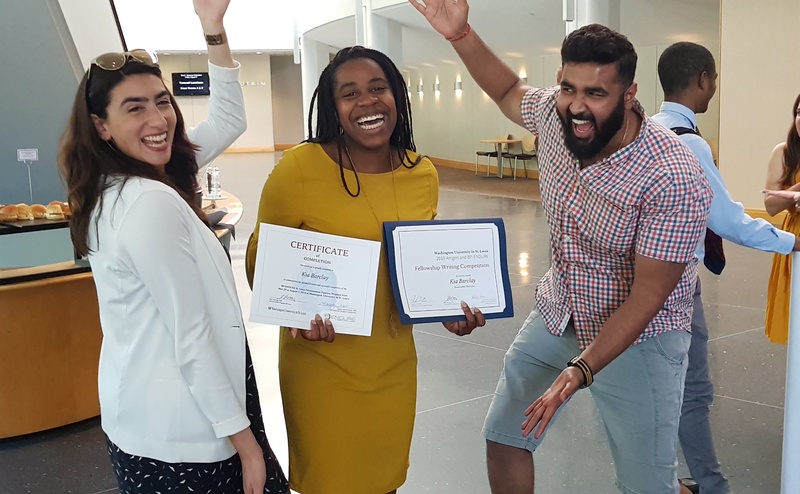 Summer research student wins Washington University's 2018 Amgen and BP-ENDURE Fellowship Writing Competition on Friday, August 3rd at the Eric P. Newman Education Center. 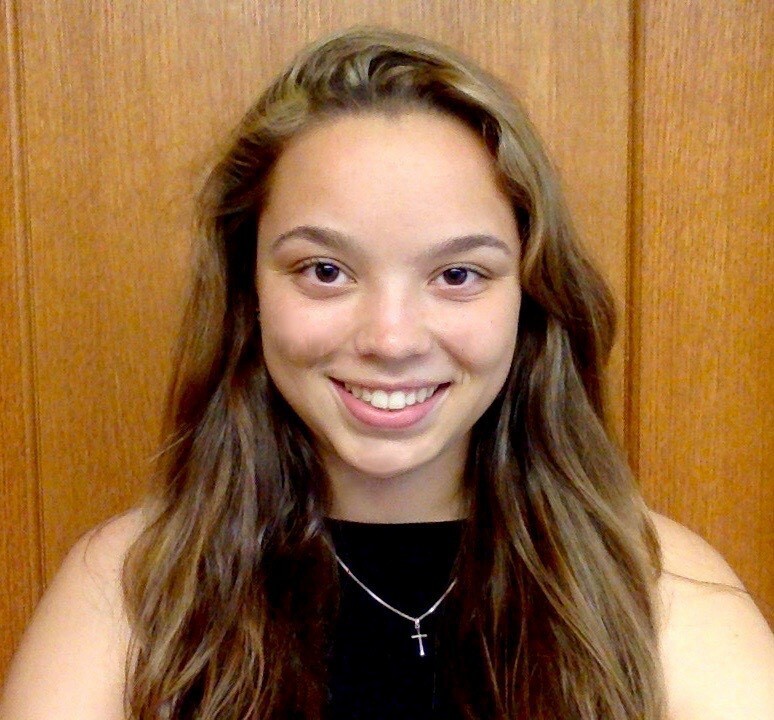 Center faculty sponsored Kia Barclay, undergraduate student at Wellesley College, this summer for the Washington University in St. Louis Neuroscience Pipeline Program. Ms. Barclay received the 2018 Amgen and BP-ENDURE Fellowship Writing Competition at the program's goodbye lunch earlier today. The United States is in the grip of an epidemic. Opioid drugs are powerful pain-relieving medications, but come with a high risk of addiction. According to the Centers for Disease Control and Prevention, 91 Americans die each day from opioid overdoses, and that figure is rising. Dr. Majumdar and colleagues are working to combat the epidemic, but perhaps the frontline science is chemistry. Dr. Karen Seibert, Ph.D., founding director since May 2016, has been appointed the Executive Director of the Center. Under her leadership, the Center has successfully recruited five faculty and more than 25 postdoctoral research associates, graduate and undergraduate researchers, and technical staff. Dr. Seibert is Professor of Anesthesiology, Pathology and Immunology, and Genetics at Washington University School of Medicine and serves as the Associate Director for Shared Resources for the Siteman Comprehensive Cancer Center. Dr. Susruta Majumdar, Ph.D. has officially joined the Center faculty. His research is aimed at attaining functional selectivity of opioid agonist action from its own target adverse effects while integrating chemical synthesis with biochemical, genetic and pharmacological approaches. 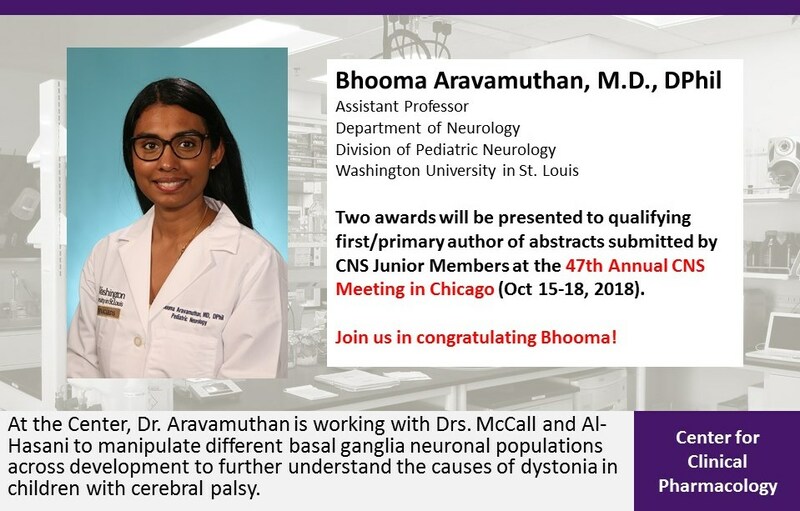 He will work in collaboration with faculty at the Center, STLCOP, and across WUSM to advance our research mission and objectives. 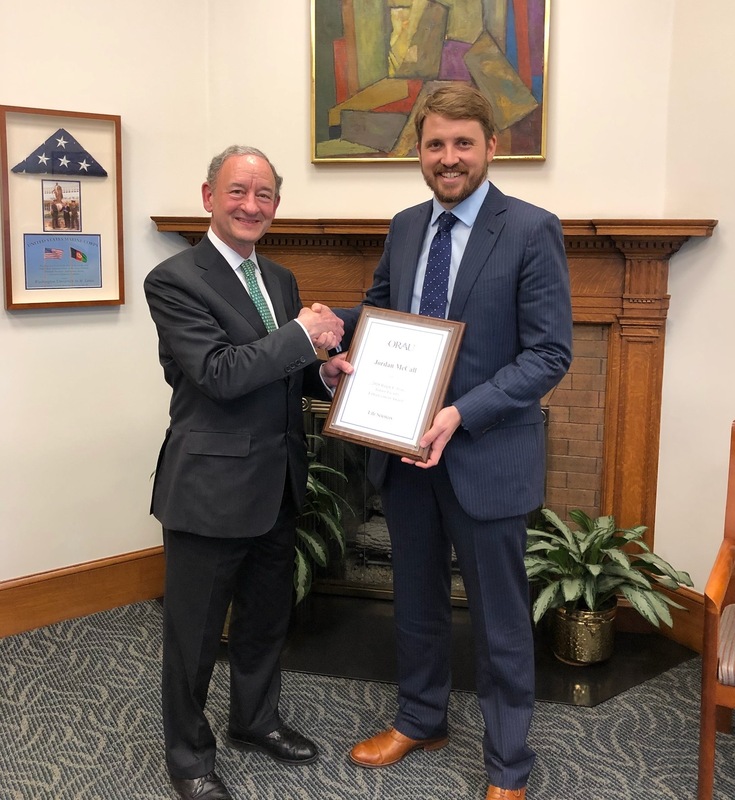 Dr. McCall shakes hands with Washington University's Chancellor, Dr. Mark S. Wrighton, Ph.D., as he receives the 2018 Ralph E. Powe Junior Faculty Enhancement Award on June 22, 2018. 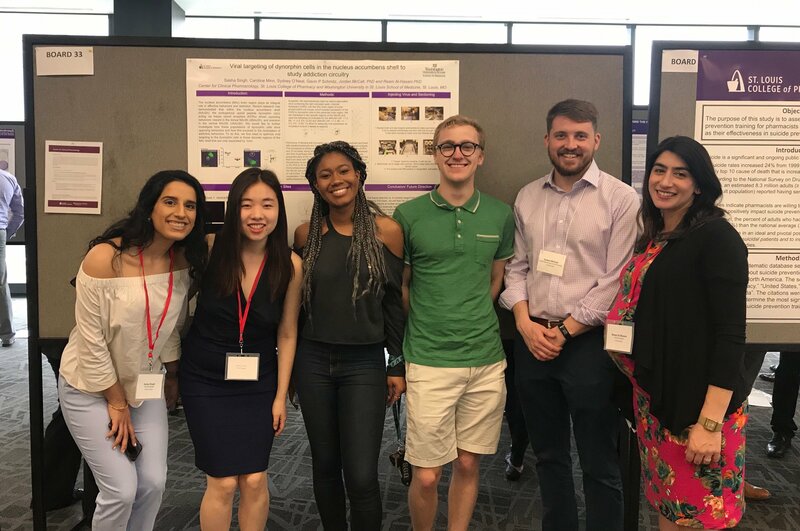 Four STLCOP students were selected to participate in the Center's inaugural Summer Research Scholar Program. 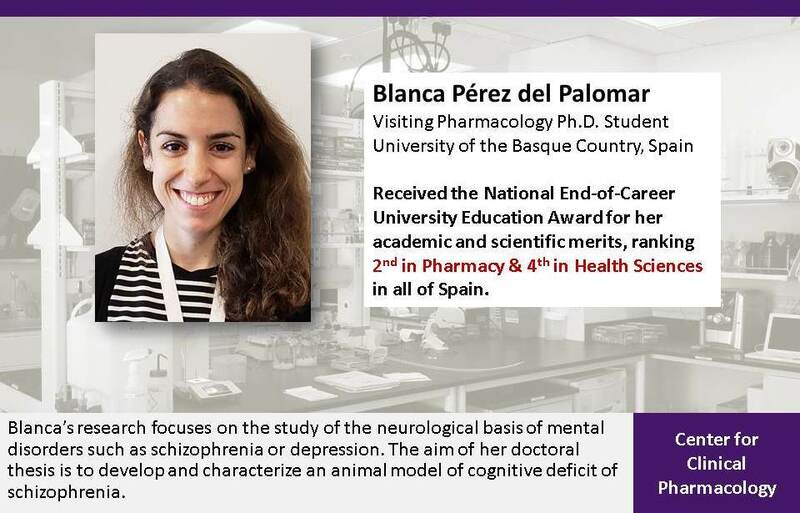 Students are introduced to research in pharmacology, neuropharmacology, and neuroscience under the guidance of Center faculty mentors. Students gain a sophisticated and practical knowledge of the research enterprise as they enter the research environment and network within the community of scientists. Students experience the process of research as a creative intellectual activity and gain a more realistic view of the opportunities and demands of a professional research career. Students and research faculty gathered at the Academic and Research Building on Saturday to highlight and share their research accomplishments. Dr. Susruta Majumdar, Ph.D. will join the Center for Clinical Pharmacology on July 1, 2018. His research is aimed at attaining functional selectivity of opioid agonist action from its own target adverse effects while integrating chemical synthesis with biochemical, genetic and pharmacological approaches. The Center welcomes Dr. Thomas Burris, Ph.D. on February 1, 2018. Dr. Burris brings with him a robust laboratory whose research focuses in the area of development of new small molecule therapeutics targeting diseases such as inflammation and autoimmunity, metabolic disease, behavioral disorders, and cancer. The Center for Clinical Pharmacology has announced its schedule of events for the fall 2017 semester. Read more about the events and register to attend. ‭ With the appointment of the first faculty researchers, the ‭center is taking key steps toward executing its vision. Faculty ‭at the center will hold academic appointments at both the ‭College and WUSM. Three of the five laboratories that make ‭up the center will be led by researchers holding primary ‭appointments at the College and adjunct appointments ‭at WUSM. The other two researchers will hold primary ‭appointments at WUSM and adjunct appointments at ‭the College. 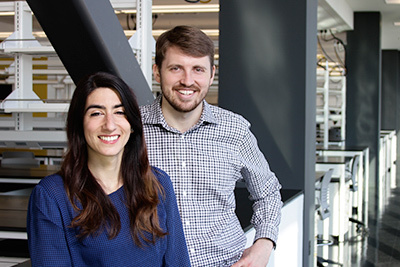 ‭The first two researchers, Ream Al-Hasani, Ph.D., and Jordan G. McCall, Ph.D., have been appointed, and they will ‭assume their new roles May 1. Learn more about Al-Hasani and McCall. The center’s initial focus will be on translational and clinical research to better understand and improve the treatment of pain. The new center will concentrate on how to best use existing drugs to treat pain, as well as on developing and identifying new analgesic drugs and other therapeutic approaches for pain.